Well, with my wife and I heading out for Turkey Day tomorrow in the (very) early morning, this will be the last chance I get to update before next week. And, just to make it even more fun, next week I am going to be in beautiful downtown San Jose, CA for a business trip. I'm bringing along a few Hawk-related trades (including JSA v.10: Black Vengeance, and Rann-Thanagar War), so if I get a chance at the hotel I might be able to update some. If nothing else I'll get the chance to read some new (to me!) comics. So there may be updates, even if they are sporadic. Anyway, have a happy and safe holiday (those celebrating) and I will see you guys later! Is there any Hawkman related stuff coming out this holiday week (well, it's a holiday here in America, anyway!)? Let's take a look. Justice Society of America Kingdom Come Special: The Kingdom -- Hawkman made a cameo appearance in last week's Magog one-shot, and I figure he will have a spot here, as well. This all leads up to Justice Society of America #21, out next week, which will seems to promise a confrontation between Hawkman, Flash, and Green Lantern. Johns has really concocted a very compelling modern superhero series in this version of the Society, and it just keeps getting more and more throught provoking as it goes on. Batman: The Brave And The Bold S.1:Ep.2: "Terror On Dinosaur Island"
Those who have been watching the altogether awesome Batman: The Brave And The Bold cartoon were in for a treat this past Friday, as who should pop up in the opening segment but the one and only Jim Craddock himself, the Gentleman Ghost! Even more fun was how Batman (with an assist from fellow Justice Leaguer Fire!) managed to subdue the spectral crook: Nth Metal Knuckles to the face, followed by Nth Metal Handcuffs! Oh, why must you tease me so? I am really enjoying this show and really hope that Hawkman shows up soon, either on his own, with Hawkgirl, or with the Justice Society. If you haven't been watching this show, you owe it to yourself to check it out. A ton of fun in true "All Ages" fashion, this is like a Silver Age comic book come to life. Title: "The Men Who Moved The World!" Summary: In Midway City, three strange humanoid creatures -- each with the head of a different animal -- break into the Midway City Museum to recover a special disc. Hawkman intervenes, but the trip is able to elude him long enough to escape with their prize, which they intend to use to alter the orbit of Earth to what it had in the year 10000 BC. The humanoids leave a faint trail of radioactivity which allows the Hawks to track them to the ancient city of Petra, in the Trans-Jordan region. Using the disc, the humanoids have activated their Oribtron device, which will shift the poles and thus the oribt of Earth after running for one full day. Their motivation? The humanoids hail from the lost city of Lansinar, which once dominated the planet until a "rogue planet" passed too close to Earth 12000 years ago and altered it's orbital path. The gravitational effects shifted the Earth's poles, freezing Lansinar under tons of Arctic ice. The Lansinarians (?) put themselves into hyper-sleep at that time, and now finally have the disc they need to thaw out and re-establish the rule of Lansinar. The Hawks come upon the Lansinarians hideout, and are counter-attacked by the humanoids in small jets. The Lansinarians refuse to communicate with the Hawks, and draw the fight out as long as they can. Receiving a signal that the Orbitron has been activated for a full day, they gloat over their victory to the Hawks. But the Winged Wonders have a trick up their sleeve as well: the rotation of Earth 12000 years ago made the day only 18 hours instead of 24; the Lansinarians have miscalculated. With the Orbitron deactivated, the Hawks round up the Lansinarians and hand them over to the UN. Review: Definitely the "A" story of this issue and one of the all-around better Silver Age Hawkman stories I have read so far. The science-fiction aspect of this story, with its strange villians and literally world-shaking implications, really helps it stand out. Fox seems to have really put some thought into this one, as we get a lot of background on the humanoids and their city; of course, we'd never see them again! I'm seriously surprised that we didn't see some variation of the lost city of Lansinar show up under Geoff Johns. Although, apparently they did show up over in Wonder Woman at some point, so there you go. The twist to defeat them is fairly novel as well, with the Hawks once more using that all-important Absorbascon knowledge to outthink their foes. I also want to call out Joe Kubert's wonderful art, including that cover. Wow! Great fun all around. Image: The Brave And The Bold #44, 1962, Joe Kubert. "Instantly recognizable among comic fans, Hawkman is one of the most iconic heroes ever created. Inspired by tales as old as mankind and those much more recent, this four-color legend has left an indelible mark upon the comic industry. 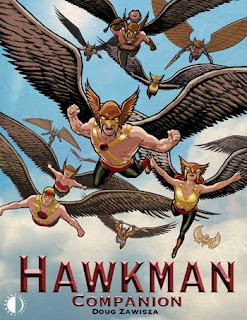 Behind a fabulous CLIFF CHIANG cover, this collection contains interviews and commentary from many who have helped Hawkman soar through the ages, including JOE KUBERT, GEOFF JOHNS, SHELLY MOLDOFF, TIMOTHY TRUMAN, JUSTIN GRAY, JIMMY PALMIOTTI, RAGS MORALES, STEPHEN SADOWSKI, DON KRAMER, BEN RAAB, TONY ISABELLA, DAN JURGENS, ROY THOMAS, STEVE LIEBER, MURPHY ANDERSON and many other top comics creators. Also included is a copious image parade, profiles on the Hawks through the ages, as well as their allies and adversaries, and a timeline of Hawkman's storied existence throughout the DC Comics Universe. With insight into the character and the creators who made him what he is, the HAWKMAN COMPANION is certain to please any Hawkfan. Written by Doug Zawisza!" Sounds like a winner to me! You can order it through Amazon, or direct from TwoMorrows at this link. I'm definitely jonesing for this bad boy now! Any Hawk-related stuff this week? Let's take a look. Justice Society of America Kingdom Come Special: Magog -- Hawkman was not in last week's Superman Special, but it was worth picking up anyway, so I am going ahead and giving a nod to this Special as well. The big Gog storyline which Johns is working in JSoA has been going on for a while now (especially since "Thy Kingdom Come" was essentially the prologue for it) but I have not grown tired of it yet, so I am happy to see it continue for now. Rann-Thanagar Holy War #7 -- Now this one I can pretty much guarantee Hawkman will be in. What does Starlin have in mind, and how does it tie into what Dan DiDio has been telling us? The return of Adventure Comics to the DC lineup further fuels speculation: Will Mystery In Space, perhaps featureing Hawkman and Adam Strange, be the next "classic" title to make a comeback once again? We all have to wait and see, unfortunately. Summary: Following the note pinned to the yeti's body at the end of the last issue, Hawkman and Hawkgirl (along with Jayita and Danny) head to the Himalayas to track down Speed Saunders. They are lead by a mysterious sherpa named Rajak Darkraven, who's raven guide helps him navigate the treacherous climbs. Hawkman is cool and professional to both Hawkgirl and Jayita, which makes both women shake their heads at his stubborness. Back in St. Roch, Chief Nedal continues to dig deeper into the case of Kendra's murdered parents, and is warned by Officer Isabella that he is becoming obsessed with her. Nedal dismisses it and claims he is trying to clear a cold case. At Stonechat Museum, Jeremy Barlow has found that Susan Morrison has snuck one of her sculptures (a rude one of Jeremy at that!) into a display and removes it, but the two get a scare when a familiar ghost with a monocle and top hat appears before them. In the Himalayas, as the team begins to crest onto a planteau, they suddenly are attacked by a ferocious band of yetis. The fight is furious in the wind-driven snow, until the yetis cries cause a small avalanche, burying the entire team... except Darkraven, who has lead them to an ancient temple. Here we find the person who hired him: Helene Astor, the re-incarnation of Hath-Set! Review: Things take an interesting turn here as old school Hawk baddie Helene Astor pops up. I suppose this should not be too much of a surprise as Johns and Robinson pretty much told us about her in the profile of Kristopher Roderic in the Secret Files & Origins issue. It's fun to get another exotic setting, and Morales has plenty to keep him busy this time out between the snow, the winter gear for most of the team (save the Hawks, naturally, thanks to the effects of the Nth metal!) and the yeti tribe. The appearance of Gentleman Ghost at Stonechat doesn't get resolved for a while, but does tie in to issue #7, which I will have a write up for later. All in all another strong issue. Image: Hawkman v.4:no.10, 2003, Rags Morales. Adama, who of course runs the finest Green Arrow blog on all the intarweb, Dispatches From The Arrowcave, picked up this Hawkman toy for me down in his hunts in Atlanta. And I am glad he did, as this figure has been completely impossible to find up here. Needless to say this act of selflessness is what earned Adama his Honor Wings. The figure itself is very nice. The Bruce Timm-esque proportions don't always work on all characters when translated to three dimensions, but for Hawkman, the barrel chest and trim waist are spot-on. You can practically hear James Remar's voice coming out of this guy. The helmet is the classic design, as used on the television show, and the colors are perfect. His mace accessory is nice, echoing the similar weapon included with the old Super Powers toy (oddly, since Hawkgirl used the mace exclusively on the show, Hawkman was never shown to use this weapon on Justice League Unlimited!). His wings give the character a nice heft and have the added benefit of acting as a sort of counter-weight. I had Hawkman standing on an end table in my living room all weekend and he only fell over three times, which is quite amazing if you know these figures. Still, I may have to invest in a stand for him. The main gripe I have about the toy is his wing harness. Not his wings, which although they are static look quite sleek and eye-pleasing, but the harness itself. Since the nature of the Justice League line is to reuse as much as possible -- fitting, considering the similar build of most of the characters as designed by Timm and company -- his harness and Nth metal chestpiece are painted on rather than sculpted. Add to that fact that the chestpiece itself is a little too big, and it's kinda disappointing. 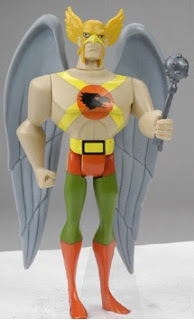 But, given that it is still a Hawkman toy in the form of his very cool DCAU character model, I cannot complain too loudly. If you can find him, I recommend him. 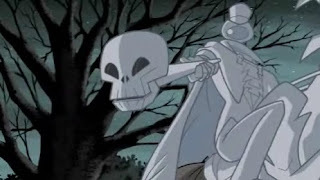 Now Mattel needs to get busy with Gentleman Ghost and Shadow-Thief! 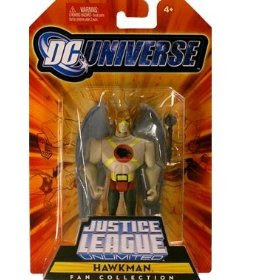 Image: Justice League Unlimited Hawkman, retreived from unknown. Summary: Scultper Boris Nickaloff has discovered a special clay, called plasm clay, which allows him to bring his sculptures to life. He sculpts a hulking man named Czar, which he uses to commit crimes for him. Czar's golem-like body allows him to shrug off normal weapons. Hawkman's first thought is that the being is a vampire, but his silver bullets have no effect. So the Winged Wonder tracks Czar's creator, where he overhears his one weakness: that the artificial man needs to breathe. Armed with this knowledge, Hawkman picks a bolas from his arsenal, and sets out just in time for Shiera to be kidnapped by Czar. Meeting again, Hawkman throws his bolas at Czar, but Boris dives in the way, saving his creation but at the cost of his own life. Czar tries to make his escape, but another well-placed throw takes down the unkillable man for good. 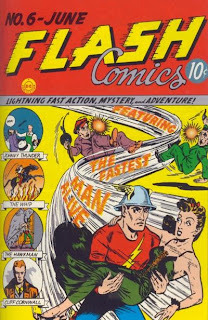 Image: Flash Comics #7, 1940, Sheldon Moldoff. DD: Hawkman has not gone two different ways. ...As with Hawkman, we were trying to create a sensibility that there might be more to the story of Hawkman – that was a story concept. If we go back to that particular story by Jim Starlin, nothing really changed – it just brought questions up to the front, and those questions will be played out later in the year. Oh, and let me finish that statement – they will be played out to the satisfaction to everybody who enjoyed and embraced the origin that Geoff Johns put forth when the character was reintroduced. Everything works together. Interesting! Perhaps there is something to the fannish notion I had about there being two distinct Hawkmen, one for Johns to write and one for Starlin to write. Or maybe the Carter Hall Hawkman goes back to Earth-2? Should be interesting to see if nothing else. 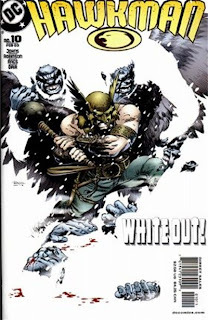 Wednesday is usually a good day for finding new Hawkman stuff at your local comic book shop, so let's see what we have this week. JLA/Avengers TPB -- The epic worldbender by Busiek and Perez. I picked up the first three issues of his back at HeroesCon but have not had a chance to read them yet. But with this many characters you know the Hawks are in there somewhere. Justice Society of America Kingdom Come Special: Superman -- Hawkman didn't show up in last week's issue of JSoA, annoyingly, but since this special (followed by two more the next two weeks) focuses on the Gog storyline instead of the Earth-2 storyline, I have to imagine that he will be more involved this time out. Summary: On Earth, Katar and Shayera discover that the United States' Independence Day falls on the exact same day as their Thanagarian holiday of Impossible Day. The gist of the holiday is that all Thanagarians must perform three "impossible" tasks to honor an ancient Thanagarian by the name of Rhon Dhu. Deciding to go on a picnic for the holiday, the Hawks discover a forest fire, and use their wings to make a giant water column to extinguish the flame; by making it "rain" upwards, they have done an "impossible" task. Later, the duo comes across a pair of bak robbers fleeing in their getaway car which they have protected with an electric forcefield. The Hawks shut them down, however, by throwing bolts of lightning at the crooks -- which seems impossible, but in actuality, by using rocks made of fulgarite to generate electrical current! 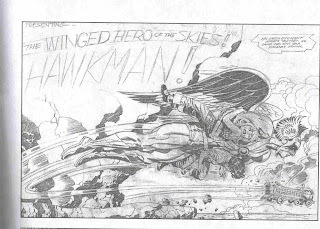 Finally, after the Midway City Museum is robbed by a crook who seems to make his loot disappear, the Hawks give chase. Hawkman is able to see the crook's "invisible" bullets thanks to having studied the scene of the crime and determining that the items disappeared thanks to a chemical spray, which he created a counter-compound for. Thus, Hawkman and Hawkgirl are able to honor their Thanagarian holiday by performing three seemingly "impossible" tasks. Review: A fun 12-pager, a typical sort of Silver Age story where the heroes are not really menaced all that much but still provide us readers with entertainment. The goofy way which Fox establishes Thanagarian "culture" is so pitch-perfect for the time period that you can't help but smile at it's quaint nature. And I am still a little shaky on how the fulgarite bit worked, but that's okay. One does wonder, though, how you manage to perform these "impossible" feats without having the Hawks' Nth metal wing harnesses and full access to the Absorbascon! For those interested, you can get a more in-depth breakdown of this story over at Dial B For Blog. Today we have this very interesting piece provided by Rick, of Comic Book Letterheads, Plastic-Man Platitudes, Let's Rap With Cap, and Mail It To Team-Up fame (whew!). According to Rick, this Jack Kirby Hawkman piece was done as a part of a proposed Hawkman cartoon series which never saw the light of day. How far along this proposal got, what network it was for, and so forth, I do not know. But seeing Jack Kirby's rendition of a character so atypical for him is a real treat for me, a fan of his work in general. A Kirby Hawkman no doubt would have been a very powerful, imposing figure. I especially like the stoic look on his face in this piece. A very big thumbs-up to Rick, who has been gifted with the Honor Wings for finding such a worthy contribution to the blog! Do you have something Hawk related? Send it along and you too can earn your Honor Wings! Summary: Fresh off saving secret agent Ione Craig from the Cult of Assassians, Hawkman has to land in the middle of the desert to check his wing harness. Returning to the skies to scout, Ione is promptly found by desert riders and kidnapped. The American agent is brought before Sheik Abdullah, who plans to sell her into slavery. Hawkman tracks her down, but is promptly subdued by Abdullah's men and thrown in the Sheik's dungeon. There, the Winged Wonder runs into Major Brent, who recently had lead an Army mission in the area and is thought dead. Sheba, "Queen of the Desert," is interested in Hawkman as a slave and demands Abdullah give him to her as a gift. Hawkman is able to escape his new mistress and meet up with Major Brent's unit outside the city limits. Together with the Army, Hawkman lays seige to the palace of Abdullah, and rescues both Ione and the Major. Sheba had tried to escape, but Hawkman dropped her in a tall tower for easy capture later. Review: As promised, the story here picks up right where "The Kidnapping of Ione Craig" finished, and appropriately, the story is comparable. Moldoff once more delivers the goods in a pulp-y, non-modern setting, and Gardner Fox's story, while simplistic, is fun and colorful. The villians of the piece are definitely products of the era which this was published, but they are so broad that I think they hold up nicely -- this is aided once more by the pulp style storytelling. Despite her big role in the last two tales, I do not believe Ione Craig would ever appear again... are you listening, Geoff Johns? 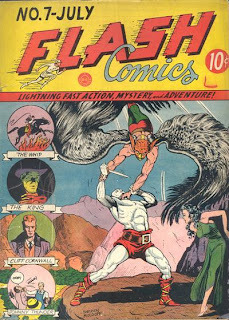 Image: Flash Comics #6, 1940, Everett E. Hibbard. Is there any Hawkman related stuff coming out this week? Let's take a look and see, shall we? Justice Society of America #20 -- With the argument about Gog's presence on Earth starting to grow, the cracks in the team's unity are starting to get bigger and bigger. On one side is Flash and Green Lantern, along with the old guard of the Society. And on the other is Hawkman, and the younger members. And what about the Justice Society Infinity coming to crash the party? Promises to be an insane series of events starting here and spinning into the upcoming JSoA specials this month, and Carter is playing a key role. From my adventures at the Greenville Comic Con this past weekend, I managed to find some nifty (and thrifty!) Hawkman treats to enjoy. The Hawk doesn't have much presence in the back issue bins in the shops around here, so I am hoping to make a big run at it next year at HeroesCon. Anyways, here's the goods. Hawkman v.2:no.1 -- Continuing my trend of finding the first issue of a new series which spun out of a miniseries without finding the miniseries. I have heard a lot of good things about the Shadow War so I am hoping this is good as well. Hawkman Special -- This ties into the second ongoing, dealing with more fallout from the Shadow War. Definitely looking forward to this one. Action Comics #588 -- Believe it or not, this crossover with the Big Blue Boyscout takes place squarely inside the second volume of Hawkman's solo title, and, keeping with the trend, ties into the Shadow War plot. Secret Origins #11 -- Featuring the Golden Age Hawkman and Power Girl. I like that this one specifically calls out that it is the Golden Age Hawkman, because at the time of publishing (Feb 87), we were still in the grey area about the Thanagarian Hawkman. Also, should be fun to read Power Girl's now out of continuity Atlantis origin. Showcase #101 -- If I remember correctly, this is from when DC brought back Showcase for a little while in the late 70s. 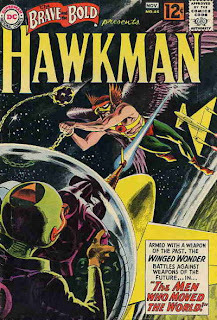 In any event, this one features Adam Strange guest-starring with the Hawks and looks like a lot of fun. Rann-Thanagar War TPB -- Well, I kept threatening to buy it, and I am glad I held off until now, since I picked it up for $5! Woo! A pretty good haul, I'd say! And all of this for less than ten bucks, so it was a pretty good deal to boot. Purchased in Atlanta for me by my good friend Adama, he of the Dispatches From The Arrowcave. I had never seen this figure anywhere around where I am, so I am very much grateful for his assistance. As such, Adama has been awarded the Honor Wings! I'll have a more in depth review of the figure once I get it opened up and played with a bit, hopefully this week. Do you have something cool or noteworthy featuring Hawkman? Send it along to me and you too can earn your Honor Wings!